Fully revealed in 2005, the verso of this sheet is inscribed with a gray-brown ink ".T." that is quite reminiscent of the "Melzi-Leoni" markings on Leonardo’s drawings and manuscripts. The study for the head of the Virgin on the recto has sometimes been doubted by scholars 'ex silentio' as being by Leonardo, possibly because its magical beauty renders it suspicious (Walter Vitzthum in 1966 quoted a recent English critic’s opinion in his support, "the drawing makes one think of Walter Pater’s mind rather than of Leonardo’s hand"). However, even in Leonardo’s most densely pictorial drawings, a few traces of his left-handed parallel hatching often remain visible underneath all the layers of the worked up medium. As the detailed scientific analyses of 2002-2003 demonstrated, this drawing is done with a nearly seamless sfumato technique, and is extremely homogeneous in its dense use of red and black chalks, revealing extensive, unified left-handed strokes in the rubbed-in intermediate shadows; these lines are also partly evident with the plain, unassisted eye (laboratory examinations by Marjorie Shelley and Rachel Mustalish, Paper Conservators, The Metropolitan Museum of Art; microphotograph details published and discussed by Carmen C. Bambach in Metropolitan Museum of Art 2003, pp. 41-42, 46-47, figs. 35a-d). The left-handed strokes in the intermediate shadows of modeling had almost gone unnoticed until 2002-2003, as this drawing is much too often discussed by scholars from photographs, rather than from analysis of the original; one early historian who discerned the faint evidence of the "tratto alla mancina" in the drawing was Theodore Rousseau, the curator who acquired the work for the Metropolitan Museum of Art (see press release, dated 8 June 1951, Archive of The Metropolitan Museum of Art). The structural, delicately curving lower right to upper left strokes of the silvery, soft black chalk are most evident to the unassisted eye in the area of the Virgin’s forehead, while the short, left-handed strokes in the under-drawing done in red chalk are best evident in microscopic enlargements. Since this left-handed hatching is extensive, the drawing of the Head of the Virgin must unquestionably be authentic, and must have also served a creative, exploratory purpose in Leonardo’s design process. 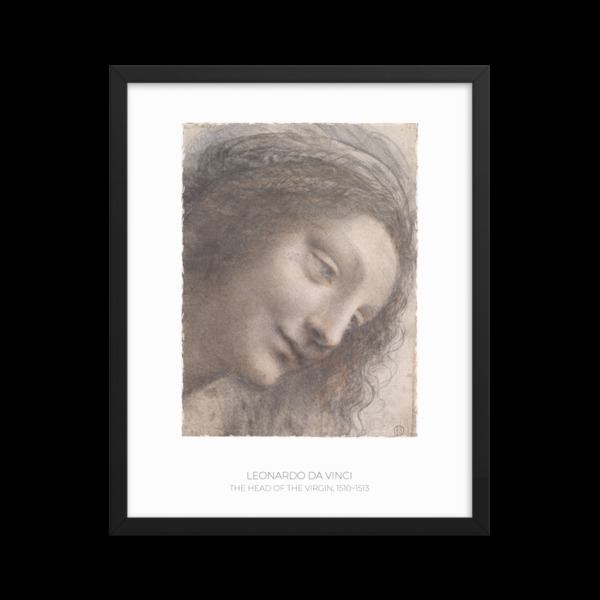 Among the great believers in the attribution of the drawing to Leonardo himself was Jean Paul Richter (the eminent anthologist of Leonardo’s writings), who catalogued the work in 1910, while it was in the collection of Dr. Ludwig Mond in London; most authors who have published an opinion about the Metropolitan Head of the Virgin have accepted it as an original work by Leonardo. While an attribution to Leonardo was hesitantly maintained by Carlo Pedretti and Patricia Trutty Coohill in 1993, they thought the drawing problematic and "so thoroughly overworked that one cannot penetrate to its original character" (this is not correct according to the most recent condition reports of the drawing in laboratory conditions in November 2005); the same authors considered the drawing a "bozzetto" with strong hints of the style of Bernardino Luini and Bernardino Lanino. It must be emphasized that the areas of intervention by later hands on the drawing are minimal (as is clarified by ultraviolet and transmitted light), and that the issues of condition are also minor: tiny flecks of dark accretions in the corner of the left eye, a slight vertical, curved area of abrasion at the base of the nose, and some strengthening of the deepest shadows of the nostril and lips. The design of the hair (done in places with bold, incisive strokes of the hard pointy black chalk at upper left) reveals noticeable changes of design by the artist. Still faintly visible are a pattern of tight curls done with small curving strokes on the side of the face (curling tendrils of hair similarly obscure the face in some of the Leda head studies; RL 12515, 12517, Windsor), while at least two alternative ideas for the forms of the thick braids enveloped in the veil-headdress at the crown of the head are explored with free, expressive strokes in partly erased layers of drawing in black chalk and then reworked differently on top (the alternative designs are comparable to some of Leonardo’s late head studies; RL 12533, 12534, Windsor). Recent positive opinions of the drawing have been stated by Pietro C. Marani (1999-2000), Martin Clayton (1996-97, 2002-2003), and David Alan Brown (2003). This study is closely connected to the final design of Leonardo’s oil painting on panel, the Virgin and Child with Saint Anne (Musée du Louvre, Paris), which the present author dates to ca. 1508–12 (in agreement with Pietro C. Marani, Leonardo: una carriera di pittore, Milan, 1999-2000, pp. 275-78). Although the delicately finished drawing surface of the Metropolitan Museum study has suffered somewhat from slight abrasions throughout, it is still possible to appreciate the atmospheric dissolution of the Virgin’s relief-like forms as a work of superb technical virtuosity. The artist reworked much of the drawing in soft black chalk with red chalk (this red chalk layer is especially evident in the face, but it is found in the hair as under-drawing), and used a sfumato technique to unify the layers of medium. The soft smudging of the strokes into seamlessly blended tone exactly recalls Leonardo’s famous note intended for the "Libro di Pittura," of 1490-92, in the Paris Manuscript A, fol. 107 verso (B.N. 2038, fol. 27 verso): "… che le tue o[m]bre e lumi sieno uniti sa[n]za tratti o segni, a uso di fumo." More importantly, the Metropolitan Museum study vividly illustrates the depths of Leonardo’s explorations of optical phenomena late in his career. Like a number of other drawings associated with the Louvre painting of the Virgin and Child with Saint Anne, this sheet is an important example of Leonardo’s innovative development of complex pictorial techniques of drawing, in order to materialize his scientific research on the perspective of color, the disappearance of form, and the gradations of light and shadow, as discussed in his notes of 1513-16 (see RL 19076 recto, Windsor; Paris Manuscript G, fol. 37 recto; Paris Manuscript E, fols. 15 recto-17 recto, 32 verso, 80 recto-verso). He advised artists that their drawings attempt to capture such minute types of observable phenomena, as the reflected varieties of brightness and darkness from surrounding objects onto primary forms (Paris Manuscript E, fol. 17 recto). Of the other closely related preparatory drawings for the Louvre Virgin and Child with Saint Anne that exist, the Metropolitan Museum Head of the Virgin seems exactly comparable in date to the study in soft black chalk or charcoal for the head of St. Anne (RL 12533, Windsor), to the studies in red chalk on ochre prepared paper for the Christ Child (Gallerie dell’Accademia 257, Venice), and to some of the detail studies for the draperies (RL 12530, 12532, Windsor; Louvre 2257, Paris). See recent discussion in Carmen C. Bambach (ed. ), Leonardo da Vinci: Master Draftsman. Exh. cat. New York, The Metropolitan Museum of Art. New York, 2003, pp. 557-70, nos. 105-109; Francoise Viatte and Varena Forcione (ed.) Léonard de Vinci: Dessins et manuscrits. Exh. cat. Paris, Musée du Louvre. Paris, 2003, pp. 243-65, no. 79-90 (with an early, unconvinving date of ca. 1499 for the Louvre drapery study inv. 2257). It is also clear from other drawings connected with the Louvre painting that Leonardo continued to executed studies for the picture into his French period, in 1516-19, and especially drapery studies (RL 12526, 12527, Windsor). See Martin Clayton, Leonardo da Vinci: A Singular Vision, exh. cat., Queen’s Gallery, Buckingham Palace, London, 1996-97, pp. 132-37. A number of landscape drawings are also connected to the composition of the Louvre painting, of which the study of rock formations (RL 12397, Windsor) seems especially close in date and drawing technique to the Metropolitan Head of the Virgin. It can be said that in his drawings for the Louvre Virgin and Child with St. Anne, Leonardo transformed scientific principles into a pictorial language of magical force and nuance. The Metropolitan Head of the Virgin is among the earliest examples in Italy of the "two chalk technique," in which red and black chalks are blended for a subtly complementary pictorial effect. Among the Lombard followers of Leonardo who quickly adopted this innovative chalk technique was Bernardino Luini, whose large-scale studies of the infant heads for the painting of 1525-30, the Sleep of Jesus (Musée du Louvre, Paris) offer especially accomplished results. See Luini’s two drawings Louvre inv. 6815 and inv. 6816; discussed by Linda Wolk-Simon in Metropolitan Museum of Art 2003, pp. 667-69, nos. 132-33. Yet none of the head studies by such artists, however directly inspired by Leonardo they may be, approaches the poetry and beauty of drawing technique seen in the Metropolitan Head of the Virgin. Two early drawn copies after the Metropolitan Museum of Art drawing exist (Graphische Sammlung Albertina inv. 17613, Vienna; see Veronika Birke and Janine Kertész, Die italienischen Zeichnungen der Albertina: Generalverzeichnis,Vienna, Cologne, and Weimar, 1992-97, vol. 4, p. 2166, no. 7613; and Biblioteca Pinacoteca Ambrosiana F. 263 Inf. 67, Milan). An unconvincing attribution of the Ambrosiana copy to Cesare da Sesto was proposed by Luisa Cogliati Arano (see Augusto Marinoni and Luisa Cogliati Arano, Leonardo all'Ambrosiana: Il Codice Atlantico, i disegni di Leonardo e della sua cerchia, exh. cat., Biblioteca Ambrosiana, Milan, 1982, p. 128), as was also rightly observed by Marco Carminati (see Carminati, Cesare da Sesto, 1477-1523, Milan, 1994, p. 184, under no. 12).